I GOT A CALL from Doug (of The Mushroom Hunters) the other day. He's bivouacked somewhere down in Humboldt or Mendocino County picking blacks and hogs. 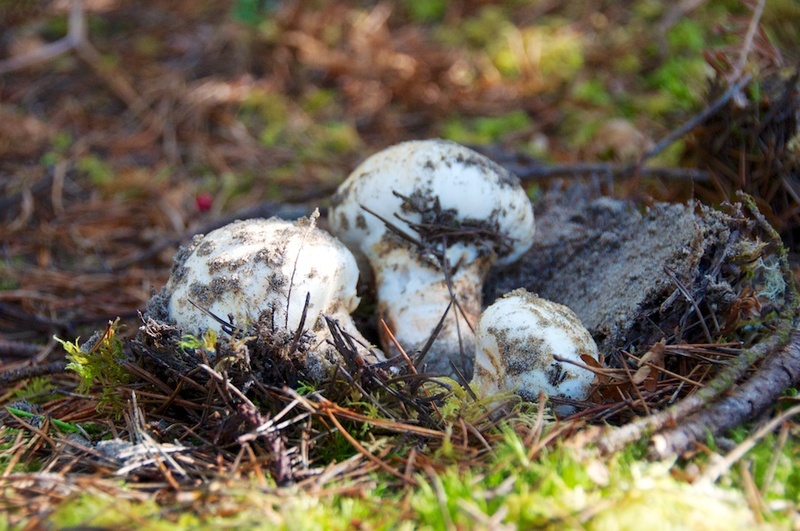 Meanwhile, Norcal friends of mine have been heckling me with texts and photos of their matsutake hauls of late. Matsutake was still on sale (for outrageous prices) at Uwajimaya in Seattle last time I looked, so if you don't live in California you might be able to make this dish with fresh store-bought mushrooms. Me, I had some just before the holiday season, which occasions this post, and probably won't enjoy it again until next fall. AS A CHILD of the seventies, I'm well acquainted with regrettable fads, from pet rocks to Farrah Fawcett haircuts. Fondu is not among them. Our family loved fondu, one of many food crazes during that unfairly maligned decade, and we went through a few different fondu cooking sets just as Star Wars was beginning its long run. Invariably the slender forks got lost or broken, and anything made of wood ended up scorched by the little Sterno tins. But under the Christmas tree each year there would be a fresh new set to put to work. Forget the Euro-Swiss cheese thing. We all preferred meat fondu, cooked in a pot of boiling oil that could have easily sent one of us kids to the ER with a misplaced elbow, not that anyone worried about stuff like that back then. My dad would bring home good beef from the butcher, pre-cut into small cubes; Mom kept the cupboard stocked with the few sauces available at the time, most of them with a Kikkoman label. I WAS REMINDED of these good times around the fondu pot after spending an evening with my friend Taichi Kitamura recently at his top-notch Japanese restaurant, Sushi Kappo Tamura, devouring Sukiyaki Hotpot. It was the tail-end of matsutake mushroom season in the Pacific Northwest and Taichi invited me to partake in a traditional preparation. With a dozen of us at the table, he had three bubbling hotpots along with platters overflowing with matsutake mushrooms, thinly sliced rib-eye and short rib, Napa cabbage, tofu, and pre-cooked cellophane noodles. Taichi doesn't use beef stock in his broth, or any stock for that matter, and I soon discovered that a simple mixture of water, sake, and soy sauce (sweetened with sugar) becomes increasingly profound as more ingredients, especially fresh slivers of matsutake buttons and premium cuts of beef, are cooked in it over the course of the evening. The matsutake gives the broth its signature taste that is reminiscent of cinnamon and spice yet earthy and, for lack of a better word, fungaly. Autumn aroma is how the Japanese describe this tantalizing flavor. By the end, all the guests were clamoring for to-go containers so they could take home the rich dregs of this amazing broth mixed with a little rice. Now I'm shopping for a fondu set—or maybe even a traditional Japanese or Korean hotpot. Regular readers will know that I've posted a Matsutake Sukiyaki recipe in the past, but Taichi has convinced me that it can be so much simpler and just as delicious. From now on I won't be sautéing any of the sukiyaki ingredients; it's just as tasty (even more so) to cook all the ingredients right in the pot, while sitting around the table with friends and family just like the old fondu days. This same method is easily accomplished in the woods, by the way, after a long day of mushroom hunting, which puts it on an even higher level in my book. 1. 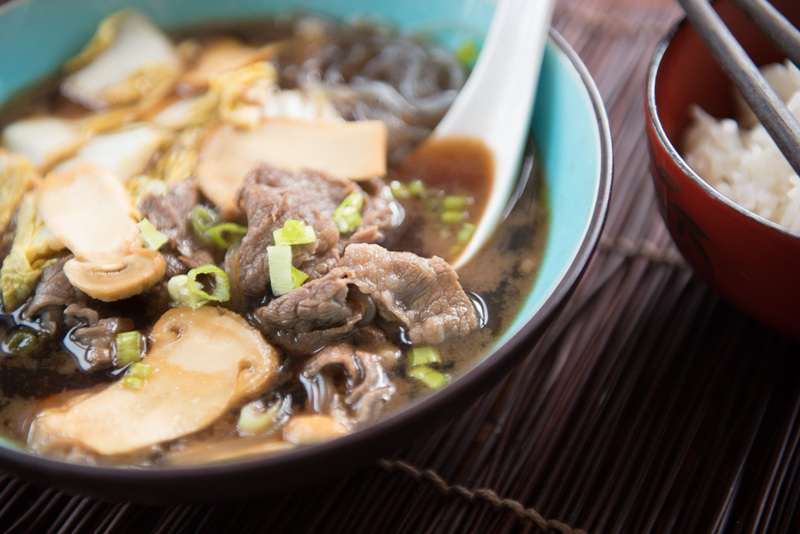 Make rice and prepare raw hotpot ingredients: arrange beef on a platter, cube tofu, slice matsutake mushrooms and cabbage, and boil noodles until al dente before rinsing with cold tap water. 2. In a pot mix together water, sake, soy sauce, and sugar. Bring to a boil, then reduce heat slightly. Allow some of the sake alcohol to burn off before adding matsutake. 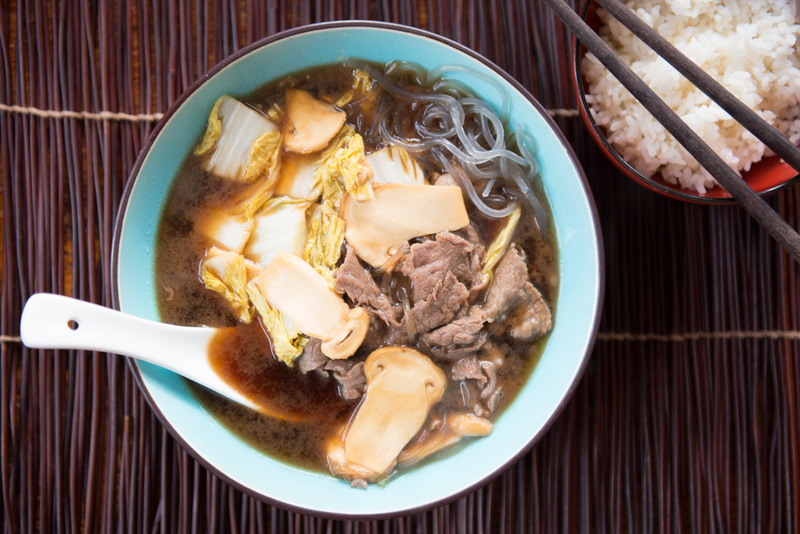 Cook matsutake at a low boil or high simmer for a few minutes until its flavor has infused the broth, then begin adding raw ingredients in small portions. Add noodles last, just before ladling into bowls and serving with rice. Repeat. And repeat again.